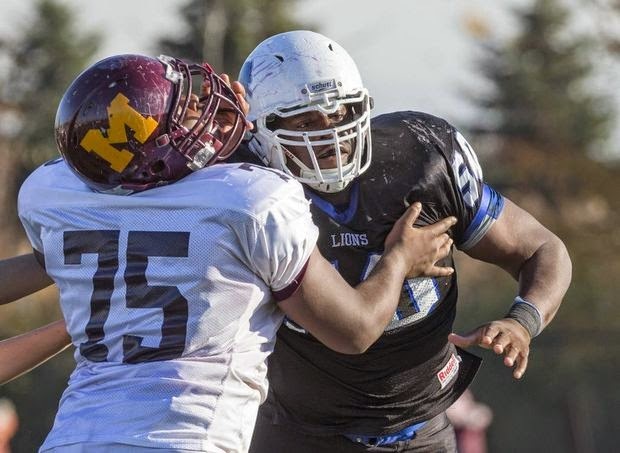 I've blogged about Qaadir Sheppard, a 6-3 230 pound LB from Iona Prep in NJ before. This article from NJ.com updates Sheppard's recruiting. Besides UMass, Sheppard holds offers from Rutgers, Boston College, Syracuse, Temple and Old Dominion. USA Today starts a college football preview countdown and has UMass as #128, last in all of football. Behind 0-12 Miami, behind 0-12 Georgia State. Dan Malone also has a mention of USA Today's article. Dan doesn't think that image is Coach Whipple either. My dear friends, I can only say "Bleep 'em all----- Go UMass!" Dan has a story on UMass' OOC opponent Penn State being projected to a seven win season. The article has an image of Coach Whipple's son Austin Whipple handing the ball off in the Nittany Lion's Blue and White game. Austin Whipple's Penn State bio. Stats from the Blue & White game here. Austin went 1-6 7 Yards 1 INT. A UMass Daily Collegian looks at his efforts to cover UMass Sports. UMass has raised $44 Million so far in it's "UMass Rising" campaign. Former UMass player Jason Tudryn has taken a job at UNC. Tudryn was a four-year letter winner with the Minutemen 1992, 93, 94 and 95. Many college football administrations believe the FBS football playoffs will expand in the next 10 years. 2014 OOC opponent Colorado has its first ever sophomore captains. The Buffs are also allowing more academically at-risk recruits. Dan Malone has a story about future Penn State transfer Alex Kenney's exploits in the Penn Relays. Coach Whipple likes vertical passing routes, I hope Kenney will provide provide the long ball aspect that the Minutemen offense woefully lacked the last couple of years. The longest completion by a UMass WR last year was only 36 yards. Matty V. says a later NFL Draft may have helped Rob Blanchflower's chances. Max Moore of Hustle Belt looks at UMass' NFL Draft history. The Detroit News looks at spring football at Central and Western Michigan. Note that Western Michigan may start as many as 14 freshman this year. Sports on Earth looks at the college football realignment scoreboard. A number of recruiting services report UMass has offered to Alec Shriner, a 6-3 281 pound OL/DL from Oviedo, FL. "Playing time and just the way they play football and how they take pride in it (are important)," Shriner said. "Distance isn't a factor for me, but it's a benefit for USF being so close." Shriner and his family recently took a trip to Georgia Southern, but have no scheduled visits in the near future. The offensive also has no leaders in his recruitment, but hopes to make his college decision before his senior campaign." Besides UMass, Shriner has an offer from South Florida. Jesse Allen of Hustle Belt looks at UMass' quarterback options and doesn't like any of them. e-Bay has a number of Rob Blanchflower Upper Deck rookie cards. In addition, they have some by other companies. One of Victor Cruz's rookie cards goes for as high as $225 (by the time you click the link, the list probably will have changed). Vladimir Ducasse's senior bowl card. OOC opponent Penn State will open against UCF in Croke Park (good name) Ireland. The Orlando Sentinel looks at the top storylines to watch in MAC football. If your eyes haven't glazed over yet-------- another Khalil Mack analysis, this time by a Vikings blogger. Former UMass player Stacey Bedell joins a deep group of running backs at Stony Brook. I've blogged about Daiquan Kelly, a 6-3 210 pound athlete from Union City, NJ before. This April 24th article updates his recruiting. Kelly is now ranked #14 in the New Jersey Top 50. "Obviously with those comments from the coaching staff, Syracuse is recruiting Kelly as a safety. 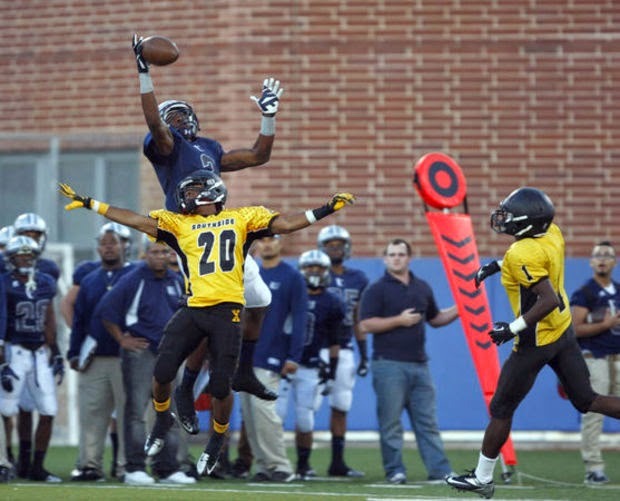 The three-star talent prefers to play defense as opposed to offense, despite his abilities as a wide receiver. In fact, the Orange vaulted to the top of his list after a strong visit. Kelly said he has visits planned to Michigan State and UMass before making a decision. A return trip to Syracuse is also a possibility." Besides UMass, Kelly holds offers from Michigan State, Rutgers, Syracuse, BC, Virginia, Pitt and Old Dominion. Dan Malone has five questions with Trey Dudley-Giles. In the two years we've been in FBS, the one unit that's been competitive both years has been the defensive backfield. Scout.com has Buffalo's Khalil Mack on their NFL draft "dream team". And now----- college football games in Mexico City? The new college football Hall-of-Fame will open in Atlanta in August. Dan Malone has a short article on Jovan Santos-Knox's video tour of the new UMass football performance facility. I did a blog post on the video back last Saturday. Dan also has a story about Upper Deck's Rob Blanchflower rookie card I blogged about yesterday. NFL.com's draft bio on Blanchflower. SB Nation blog "Hogs Haven" says Blanchflower best fits with the Redskins, Bucs or the Falcons. SB Nation looks at what college football players do during the off season between spring practice and fall camp. The NCAA just changed the rules to allow mandatory summer workouts. The NCAA is looking at how the non-BCS conferences: the American Athletic Conference, USA, MAC, Mountain West and Sun Belt should be tiered. Victor Cruz thinks the Giants should target another receiver in the NFL Draft. Newsday says Cruz is looking for more home runs in 2014. Gators transfer Tyler Murphy has been named starting QB for Boston College. Penn State boosters look to move the Joe Paterno statue that the University put in storage to downtown State College. Amazon has only three Upper Deck Rob Blanchflower rookie cards available. Get yours now! The Orlando Sentinel ranks UMass #123 out of 129 FBS teams in a preseason review. That image sure doesn't look like Whip. WWLP did a survey of UMass students and found less than 1/3 supported a player union. USA Today says Khalil Mack rises to elite status in the NFL Draft. CBS Sports predicts Mack to be #3 overall in the NFL Draft. Two former football players, including one from Boston College, are charged with beating a homeless man in Allston. The Lions welcome James Ihedigbo. Victor Cruz on the Giants new offense. 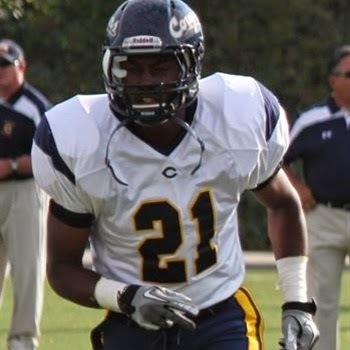 Several recruiting services report UMass has offered to Dartez Jacobs, a 6-2 200 pound safety from College of the Canyons, CA. Jacobs will have two years of eligibility to use in three years. In his sophomore JUCO year, Jacobs had 31 TT, 1 INT and 1 BKUP. Dan Malone profiles freshman LB Da'Sean Downey. His UMass bio is here. At 6-5 240, Downey is blessed with a BCS---- or NFL for that matter sized body. As an early enrollee he could play significant role in the 2014 defense. 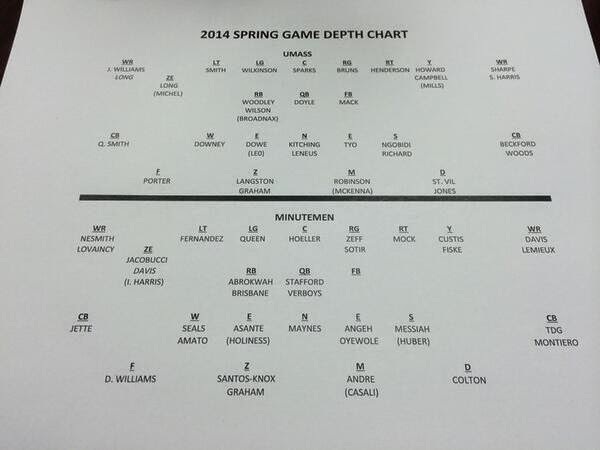 Both Steve Casali and Shane Huber did not take part in the spring game. In August, when everybody should be healthy, the linebacker corps should be a strength of the defense. OOC opponent Penn State is slated for a lot of prime time TV this year. A Virginia Tech blogger thinks Tyler Murphy will be Boston College's starting QB when the Eagles meet UMass on August 30th. Southeast commissioner Mike Silve spoke at UMass last week concerning the new BCS football subdivision. A NESN Patriots mock draft includes Rob Blanchflower. Victor Cruz, one year later. Because the state legislature has solved all the state's other problems. I've blogged about Danny Thomas, a 6-2 220 pound LB/DE from Tallahassee, FL before. Thomas just picked up an offer from UAB. Dan Malone reports UMass has added Florida International to it's 2015 and 2018 schedule. The FIU notice is here. In 2013 FIU went 1-11 with a loss to Bethune-Cookman. The Panthers did have a nice win over UAB for their homecoming. FBS Schedules has a post on the match-up. Matty Vautour looks at the ramifications of future UMass schedules. I'm not sure on how to read the tea leaves on future schedules. Playing four BCS teams as OOC opponents is brutal. No one else does this (see my blog post of April 15th). Playing two money games would be good and three would be pushing the limit if we want to have an chance for a winning season. Probably the ideal schedule would be two money games, one winnable FBS game such as FIU and one local FCS game such as Maine, UNH or RI. The Sun-Sentinel looks at the results of FIU's spring game. Meanwhile, Akron is looking forward to a big 2014 season. 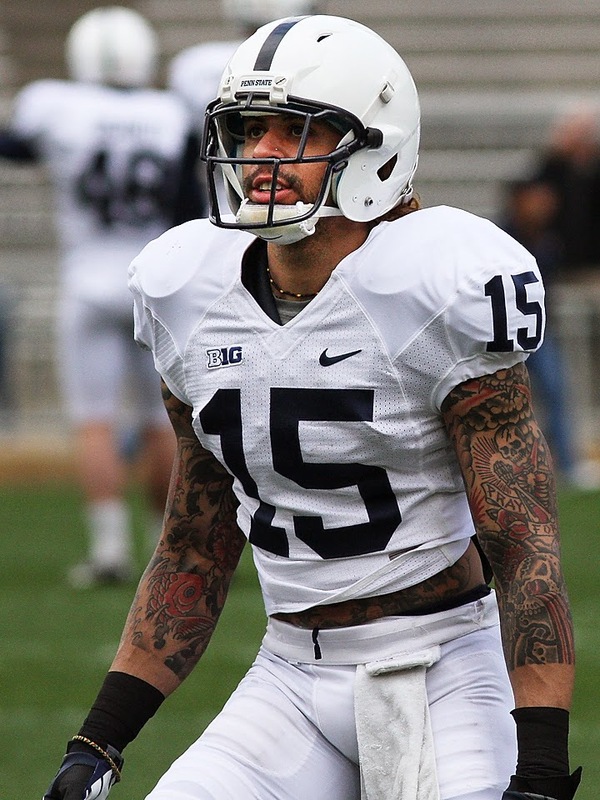 Will Penn State change their uniforms for 2014? OT, but this article mentions several players UMass hoops is recruiting. 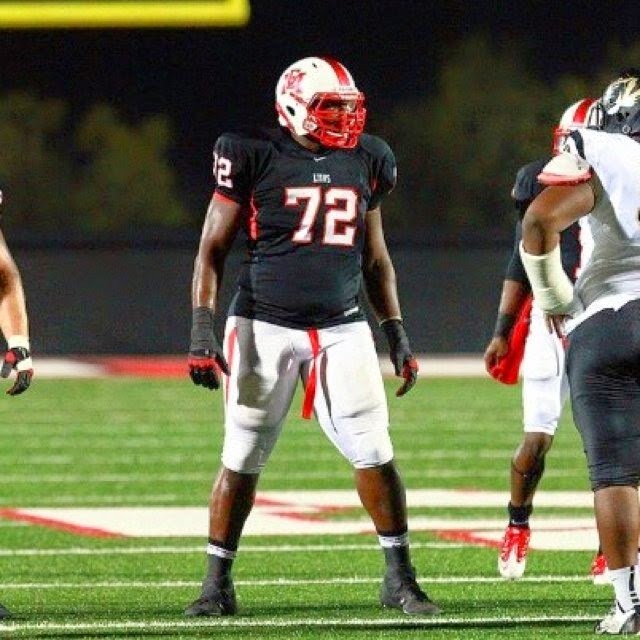 Several recruiting services report UMass has offered to Jamal Danley, a 6-5 310 pound OT from East Mississippi Community College. He's a Scout.com three star player. Partial quote from a April 17th Scout.com article on him: "Danley describes himself as a “better run blocker than pass blocker”, but he said he’s working on his pass blocking. He said that he expects to see a Missouri coach at East Mississippi next week. Danley is cognizant of just having two years remaining to play, so early playing time is going to be a major consideration in his decision." Besides UMass Danley has offers from Cincinnati, Memphis, Missouri, Middle Tennessee State, Mississippi State, South Florida and Temple. One thing I was planning on asking Coach Whipple if our paths ever crossed was if he was planning any uniform tweaks for this year. All the players were wearing the maroon helmet at the Spring Game. White pants also made a comeback. Maroon helmets, maroon jerseys and white pants would be a good home combination. A maroon helmet and white jerseys and white pants would be good for travel (but we would look like Temple clones). The StarpPress covers Bowling Green's final practice. Mentions UMass. The UMMB was at the Marathon Tribute yesterday. Hustle Belt has a series of articles on MAC NFL Draft hopefuls. Penn State's new HC James Franklin is making a splash in recruiting. As is former UMass coach Sean Spencer for the Nittany Lions. Spencer's Penn State bio. Several recruiting sources related UMass has offered to Justice Alexander, a 6-6 237 pound DE from Macedonia, OH. Hudl.com has video and some physical stats. Quote from a Scout.com article on Alexander: "I have offers from Massachusetts and Ohio University," he explained. "Buffalo said they are going to offer as soon as I visit, so they can offer me with my parents in person. I never really saw myself as a college scholarship player, so I'm very happy with things. Getting that first offer was amazing and it makes me want to work even harder." 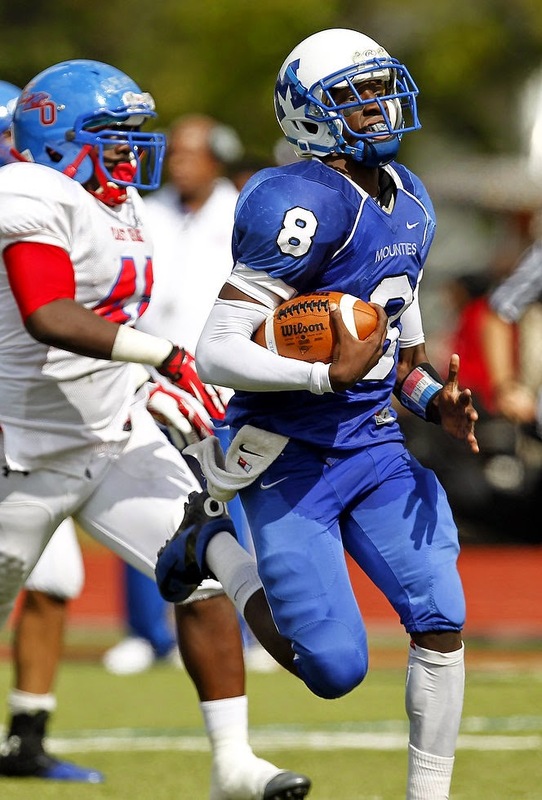 Charles Snorweah, a 5-10 175 pound RB/CB from PA committed to Rutgers. He was drawing interest from UMass, Temple and Pitt. 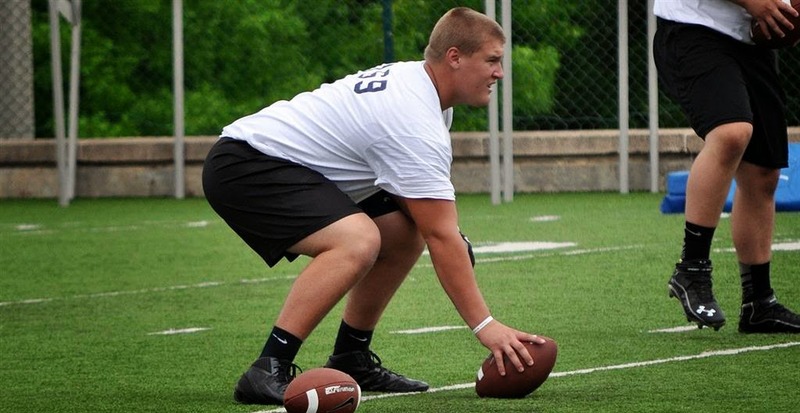 Zack Allen, a 6-6 240 pound LB from New Canaan, CT verbaled to Northwestern. Allen had offers from Boston College, UConn, Syracuse and UMass. Jovann Santos-Knox takes us on a tour of the partially completed football performance center. The locker room looks especially nice. It's going to be a great feature for Minuteman football. Black Shoes Diaries reacts to Penn State's Spring Game. 72,000 showed up for the Nittany Lions' Spring game. Josh Samuda is looking at a 9 to 10 month rehab on his ankle. The initial feeling is that it's not career ending. JMU opts to stay in the CAA. There will be a record 40 bowls in 2014. I've set up a Picasa web album of the 2014 UMass Spring Game. Below is a couple more images from the event. Dan Malone reports A.J. Doyle is ready to turn his attention to summer. He also comments on the video UMass made up of the game. Max Moore of Hustle Belt says the Spring Game showed many things. Steelers Depot has the longest NFL Draft review of Rob Blanchflower yet. They also say Blanchflower visited Pittsburgh Thursday. Josh Samuda had surgery to repair his broken leg. There was a fair amount of recruiting news this week I neglected due to the Spring game. I'll have some up tomorrow. Well yesterday was a busy day. I went from Jaffrey, NH to the Lehey Clinic in Burlington, MA and from there to Amherst to see the Spring Game. It was fun. The players continue to have high energy. I got to talk with Coach Hodges, Sign Man, Matty Vautour, Andy (who does the photography for Maroon Musket) and several of the players parents. It felt like a November game with temperatures in the high 30's. Again, the defense was still ahead of the offense, but the two JUCO offensive linemen, the two JUCO TE's, Alex Kenney and Blake Frohnapfel are not yet with the team. I took a lot of images and I'll try to have an album up soon. Click on the images below and Blogger displays a larger view. UMass Athletics has video and a story from the game. Dan Malone has five questions with Coach Whipple. Dan has a story from the game. Matty Vautour also has a Spring Game story. The UMass Daily Collegian says UMass continues to move in a new direction. The Boston Herald reports the Spring Game was a work in progress. 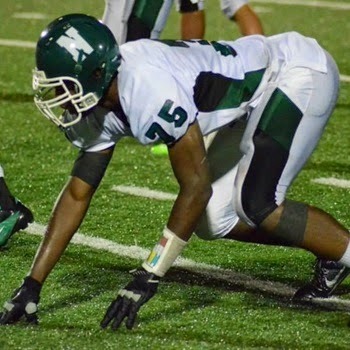 NJ.com reports UMass has offered to Diasjon Robinson, a 6-1 270 DT from Lincoln HC in New Jersey. Story about the UMass offer here. UMass is the first offer from Robinson. Drawing interest from UConn, West Virginia, Penn State, Pitt and Wake Forest. Dan Malone reports on the end of Spring camp. He also has video and Spring Game preview and expected starters. Dan has five questions with Tajae Sharpe. Matty V. has Mark Whipple and UMass are ready for the Spring Game. Jimmie Kelley of Hustle Belt previews the UMass Spring Game. Mark Borges of the Boston Herald says Mark Whipple helps UMass get better. Max Moore of Hustle Belt looks at Rob Blanchflower's NFL Draft chances. Hope to see a lot of UMass fans at the game tonight. 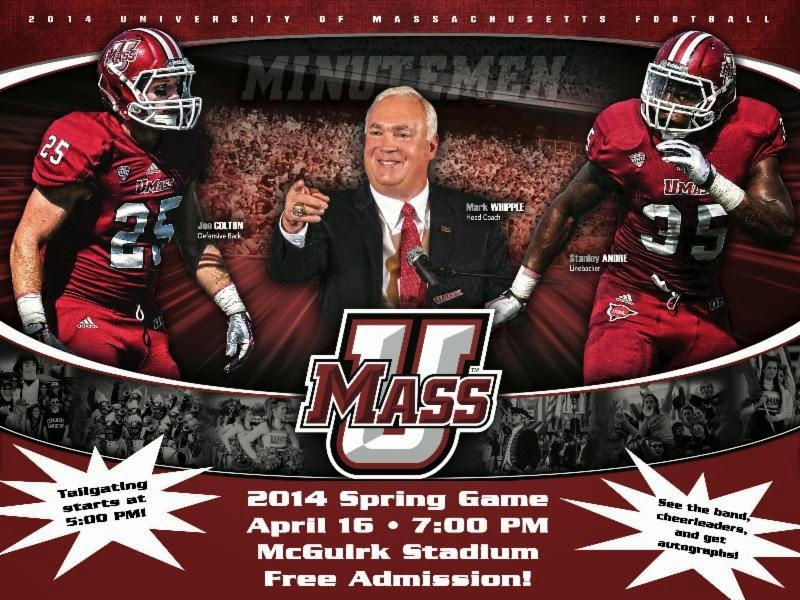 More news about the UMass Spring Game from the Minutemen website here. The game will be streamed live over the internet through the CBS All-Access Video Player. That'll help the fans who have to work and can't make the drive. The weather is going to turn cool and windy tomorrow. Everyone bring some warm clothes to layer on. Dan Malone has a story about Blake Lucas looking for a rebound season. The collapse of the Minuteman kicking game, kicking and punting was a real negative in 2013. Blake Lucas probably has the inside track on kicking. Football Scoop has 27 nuggets from the 2014 college football schedule. 16. Massachusetts is the only team in college football to schedule all four of its non-conference games against Power Five foes. Mark Whipple's Minutemen open with Boston College and Colorado at home, and then visit Vanderbilt and Penn State. A Colorado beat writer takes a series of questions about the Buff's 2014 season and mentions UMass a couple of times. Hustle Belt looks at Kent State's Roosevelt Nix's NFL Draft chances. Dan Malone reviews the UMass WR video here. I did a post on the video and the Minutemen receiving corps back on last Wednesday. As Dan points out, the offensive production of the receivers was flat out bad in 2013. Receiving yards fell from 2244 in 2012 to 1877 in 2014. Dan also has five questions with Shakur Nesmith. Shakur's UMass bio here. Nesmith is blessed with a NFL-sized body at 6-4 200 pounds. However, two career catches won't impress any scouts. Nesmith has the chance to be an impact player for the Minutemen, but we'll have to see how his desire and work ethic shows in the next four years. Dan also has five questions with Shadrach Abrowah. His UMass bio here. In addition to a great football name, Abrowah is a powerlifter. That's my game, but right now I'm more of a bench-only guy. Abrowah ran well when given the chance. He should be in the mix for FB, short yardage and the goal line offense. Dan has a post on the helmet-cam video of Trey Dudley-Giles. Matt Daily of Hustle Belt looks a Bowling Green safety Boo-Boo Gates chances in the NFL draft. ESPN has a story on what was learned from Penn State's game. Colorado names it's captains for 2014. Yesterday I watched the Buffs spring game on DVR. A little over 6,000 fans showed up to see the game. In other news from Colorado, the Centennial State's first marijuana vending machine is about to start operation. The UMass Spring Game has an official poster. The weather for Wednesday is supposedly cooler so dress warm. According to the poster, the UMMB will be there plus the UMass cheerleaders. Hope to see a lot of UMass fans at the game. 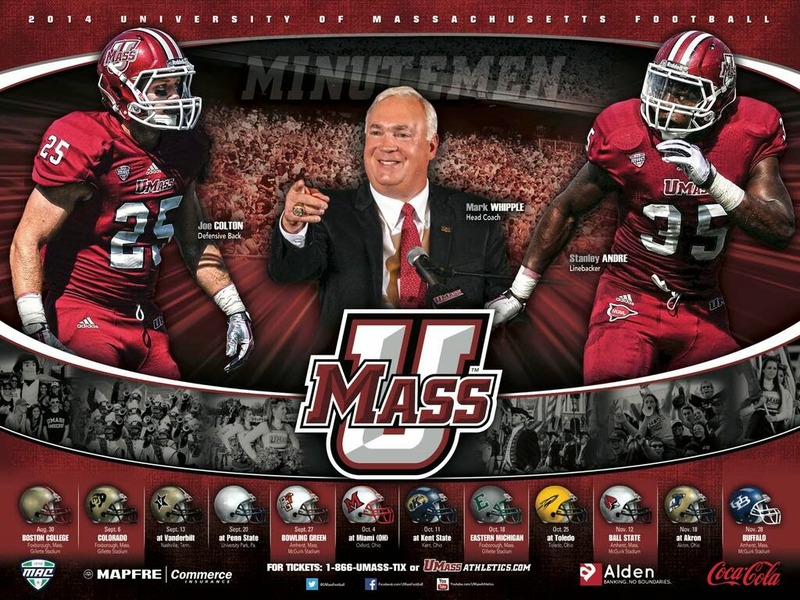 In addition, I read somewhere on the UMass website, that 2014 schedule posters will be available. The UMass website also has video of UMass DB Trey Dudley-Giles with a helmet-cam for one of last week's practices. 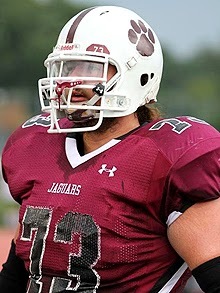 NJ.com reports UMass is showing interest in Tanner Kern, a 6-4 300 pound OL from Xavier HS in CT. This article from NJ.com has updates on his recruiting. 247Sports says Kern visited UMass during Junior Day. Kern was the top offensive lineman at the NUC Five Star East event. Dan Malone reports that former UMass QB Mike Wegzyn will join the Tennessee Volunteers. Good luck to Mike. Hope he has a successful two years with Tennessee. Marshall's Rakeem Cato is seeing more reps in spring ball due to Blake Frohnapfel's transfer to UMass. Toledo is having a quarterback battle this spring. On October 10th, the Minutemen will have their first ever visit to the Rockets. The Detroit News says James Ihedigbo brings a champion's work ethic to Lions. 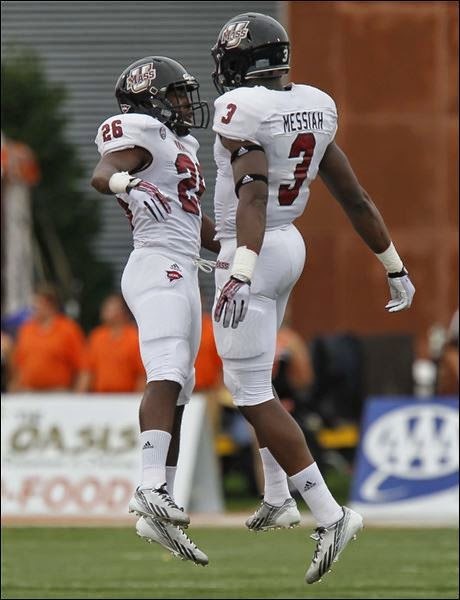 The Macomb says Ihedigbo will step up as a leader. Colorado will visit Gillette on September 9th; QB depth is not a strength with the Buffs. The Buffs spring game is today. Channel 409 on Dish has the Pac 10 Network. Penn State's spring game is also today. This article has viewing options. Matty V. is back with a story featuring the UMass linebackers. There will be some new faces available for the Minutemen linebacker corps. Trey Seals will be rushing the passer standing up. At 6-4 231, he's more of a linebacker size than a DE in FBS football. Da'Sean Downey 6-5 240 is an early enrollee in the 2014 recruiting class. Again, he has BCS size and could be a future starter. John Robinson-Woodget 6-2 225 played in 10 games in 2013, but has been getting favorable mentions during spring practice. Steve Casali and Shane Huber are still recovering from injuries suffered last fall. UMass could have enough depth this year to have some defensive packages like Brown used. The Minutemen struggled playing the 3-4 last year, especially with run stopping. That's going to be an issue this year as the starting defensive line is going to be very light by even MAC standards. If UMass had to play a game next week, I would think the starting inside LB's would be Stanley Andre 6-2 240 and Jovan Santos-Knox 6-2 240. The two outside LB's could be Kassan Messiah 6-4 225 and John Robinson-Woodget. The UMass website has video and a story from the Football Team's taking part in the Autism Speaks 5k run/walk. More on Brandon Hill and Kevin Morris' reunion at Monmouth. OT, but Michigan is looking for a "high mid-major" hoops team for a home-and-home. Four slots on the UMass slate are open now that we are not playing MAC teams. The latest iteration of the UMass Spring roster lists Emmett Odegard as #62. 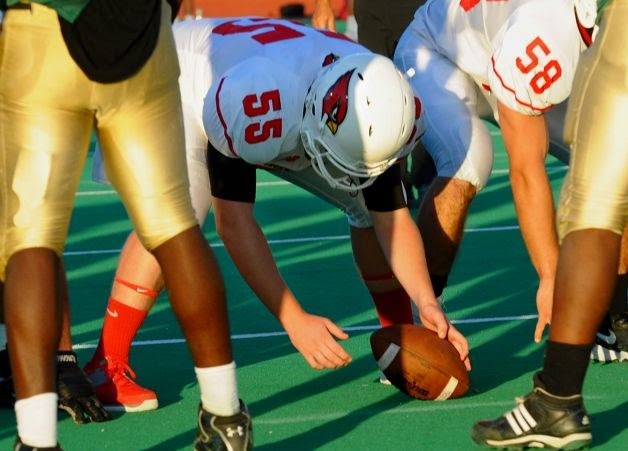 He's a 5-11, 215 pound LS from Greenwich, CT.
Rubio long snapping has a post on Odegard verbaling to UMass. Brandon Hill and Kevin Morris reunite at Monmouth spring football. Former UMass player Peter McCarty has been hired at UNH. McCarty's bio when he was coaching at Fordham. ESPN says if you can play, NFL scouts will find you no matter where you are. Victor Cruz would like to think of himself as a brand. Cruz and football are in fashion. In news from 2014 OOC opponent Penn State, a PA court is questioning the NCAA's penalties in the Sandusky case. Athlon Sports has five Vanderbilt players who will have big roles in 2014. Boston College adds another Massachusetts recruit. The UMass web site has a video featuring the Minutemen wide receivers and new receivers coach Mike Cassano. The video has quotes from Shakur Nesmith 6-4 200. He was sidelined during the practice I attended. In person, he looks even taller than his listed 6-4. Nesmith rocketed into a starting position last summer then suffered a separated shoulder against Wisconsin. He's wearing #19. Also shown is Marken Michel, he's wearing #10 , worn by Devin Brown last year. WR production was a big factor in UMass' offensive futility in 2013. Shaquille Harris and Elgin Long tied for the longest reception ------ 36 yards. That hardly fits Coach Whipple's vertical passing offense. In 2013, UMass receivers went 177-1877 10.6 AVE 9 TD's 55 Long (Rob Blanchflower) 156.4 AVE/G. The Minutemen were 103rd in passing average per completion and 111th in total passing offense. UMass opponents had significantly better stats: 189-2613 13.8 AVE 22 TD's 81 LONG 217.7.6 AVE/G. I would guess, if healthy, Tajae Sharpe would be the "X" receiver. Nesmith as the "Y" and Michel as the slot or "Z". The UMass Daily Collegian reports the Minutemen defense is embracing Coach Masella's 3-4 defensive scheme. Football Scoop says you can never have too many running backs. Rob Blanchflower gets a paragraph (#9) in this synopsis of the Pats draft needs. Or he could end up in Denver or St. Louis. 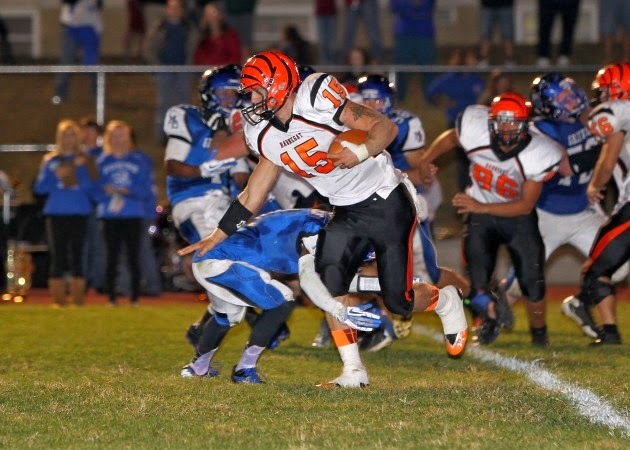 I've blogged about Cinjun Erskine, a 6-3 200 QB from Barnegat, NJ twice before. This article updates his recruiting and mentions UMass. Bleacher Report has an article from December featuring Erskine. Erskine has offers from UMass, Miami and Bucknell. UMass should buy the copyright for this article and and hand it out to recruits. A Bleacher Report writer says Penn State won't break into a sweat in its early schedule. Kent State receives $850,000 for playing at Ohio State this year. Speaking of Victor Cruz, ESPN looks at Cruz and the other Giants receivers. The Detroit Lions hope James Ihedigbo's Super Bowl experience will boost their own changes. The results from Boston College's Spring game. Colorado looks to improve on their 108th in the nation ,120.8 yards per game rushing totals in 2014. 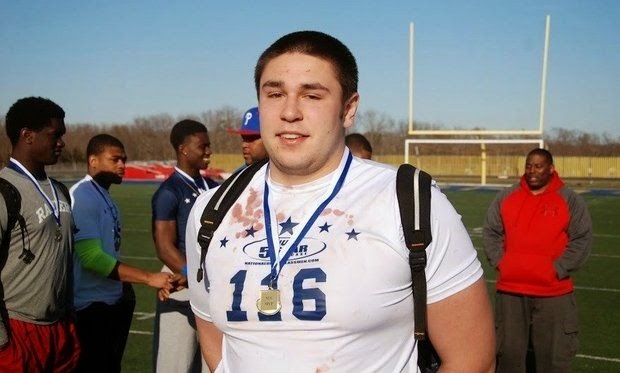 Several recruiting services indicate UMass has offered to Ted Field, a 6-6 315 pound OL from Glen Mills, PA.
Field recently picked up an offer from Rutgers. 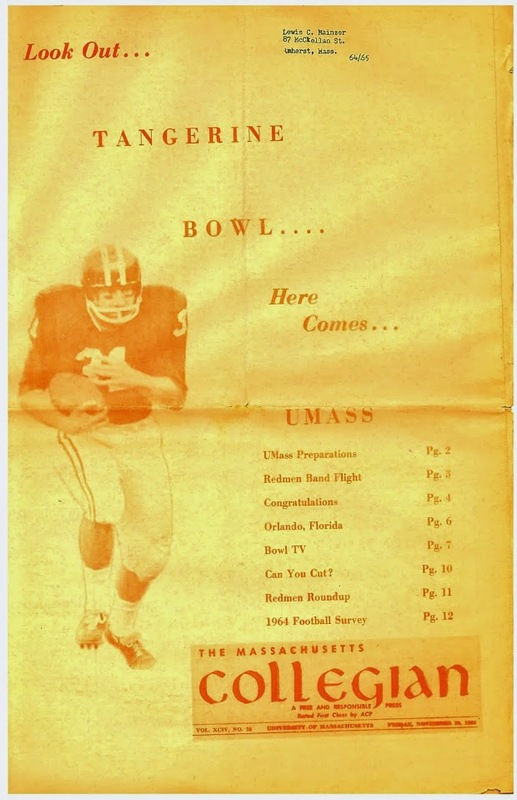 UMass was the first to offer Field. Drawing interest from a number of BCS schools. Some members of the UMass football team took part in a 5k run for Autism Speaks. Brockton's Aaron Monteiro a 6-6 300 pound OL verbaled to Boston College. Speaking of BC, the Boston Herald has a report from a spring practice scrimmage by the Eagles. Football.com looks at 10 intriguing MAC conference OOC games in 2014. Ball State will have it's Spring Game April 19th. A Washington-based sports attorney says because of the recent NLRB decision many college football teams will cease to exist by 2020. SB Nation looks at a pending lawsuit that may blow up the NCAA. I know I said I wouldn't be doing any Sunday blogging until the news cycle starts to pick up in the summer, but Dan Malone has provide us with some extensive notes on Saturday's scrimmage. First off, Dan says the offense struggled. That's not surprising, as the defense usually leads in the Spring. In addition, most of the reinforcements Whipple recruited are not on campus yet. Blake Frohnapfel should compete for the starting QB position. See the completion percentages from the scrimmage. JUCO offensive linemen Liam Porter (6-6 293) and Ryan Johnson (6-5 320) should make strong bids to start. In addition, JUCO TE's Jean Sifrin (6-7 250) and Jon Denton (6-6 260) should give Minutemen more receiving options as well as some blocking strength. Malone reports the defense was stout. The UMass defense has been the better unit the last two years despite not getting anywhere near the numbers of recruits the offensive did. That trend continued this year as per above where the offense adds two FBS transfers plus four JUCO's. The secondary should continue to be the strength of the defense. The return of Steve Casali and Shane Huber, when healthy, should add some speed to the front seven. Everyone on UMass' special teams is new this year. Dan says everyone looked OK. The Minutemen arguably could have won two more games in 2013 with better kicking and everyone would be under less pressure. Nothing went right in special teams last year. UMass was 11th in total punting last year and last in punting AVE 37.3. The Minutemen were 9th in field goal percentage despite Brandon Leavengood's 9-for-9 late showing. The return of Jordan Broadnax, who had good stats in 2012 returning kicks, could add some field position for the Minutemen. The special teams were a real liability in 2013. They have a lot to prove in 2014. I have 15 images from the April 3rd practice in a Picasa web album here. Click on the above and Blogger displays a lager image. Dan Malone has a story about UMass running backs and video from the same practice I attended. The story captures some of the heroism and futility of a 1-11 season. The Minutemen went five deep in their starting tailbacks and every one of them looked like they could play FBS football. The down side of all the injuries was UMass managed only five rushing TD's all year. That was the lowest in the MAC and probably the nation. Western Michigan also has a new running back coach. The Broncos were 12th in the league in rushing offense. UMass was 10th. Bleacher Report features Marshall QB Rakeem Cato, the player Blake Frohnapfel was stuck behind. I drove down to Amherst to take in last night's practice. If you have a chance to see one I highly recommend it. There's going to be scrimmage Saturday, but the weather is iffy. The practice was impressive. The energy level was high. There was no screwing around when the coaches weren’t looking. The players on the sideline were talking football. The coaching staff was positive with lots of "Good Jobs!" --- and an occasional "What the bleep was that?". The whole session was focused and everyone seemed intent on the drills. The speed was impressive; when the RB's or WR's turned on the jets, they really moved. I have a couple of images up today (memo to self: the anti-shake feature of my new lens works better if it's actually turned on). I hope to have a larger image gallery up tomorrow. Most of the images are closeups. I did not take any of the full unit drills. Former UMass player and coach Neal Brown talks football at Kentucky after a 2-10 season. A medical study report many football players show signs of future high blood pressure. OT, but Boston College dips into the MAC for their next basketball coach. Speaking of the Eagles, we'll probably get to see a lot of BC running back Miles Willis on August 30th. Several recruiting sources say UMass has offered to Elijah Robinson, a 6-1 175 pound athlete from Moutclair, NJ. This article from NJ.com updates his recruiting. Besides UMass, Robinson has offers from UConn, Rutgers, Michigan State, Nebraska, Temple and Virginia. Dan Malone has a story about the offensive line video released by Athletic Dept. In a previous video, Coach Whipple said he hoped to go "seven or eight' deep in the offensive line. UMass lost three starters from the 2013 O-line. If healthy, I would speculate that returning starters Matt Sparks (center) and Tyrell Smith (LG) would stay at their previous positions. Liam Porter (who played as a freshman at BC) and Tyshon Henderson will, I think be the first choices at the tackle spots. Fabian Hoeller, Josh Bruns and Ryan Johnson will be in contention for the last guard spot and two of the three will be the top reserves. The UMass Daily Collegian has a story about Lorenzo Woodley and the new offensive scheme. Bryan Vance of Hustle Belt looks at possible replacements for UMass in the MAC. An Op-Ed piece in the NY Times says college players shouldn't unionize. Boston College picks up a QB transfer from Florida. The UMass Football page on the athletic dept website lists 7:00 PM as the time for Wednesday April 16th Spring game. The website also has a Day #6 practice update focusing on the offensive line. the segment has quotes from Tyrell Smith (good name) and Matt Sparks. Dan Malone has a feature on Shane Huber who is recovering from a torn ACL and MCL. Matty V. reports on the return of Tom Mesella as defensive coordinator. Dan Malone has a story on the return of the 3-4 defense. Former UMass coach Brian Crist joins the staff at Nebraska. Josh Mauer joins the PawSox radio team.